Wilfrid Laurier University celebrated its annual Homecoming this past weekend with a Friday, Saturday and Sunday itinerary filled with scheduled events for returning Alumni, students and visitors to take part in. Saturday, Sept. 29 did, however, see the bulk of the weekend’s festivities with the Laurier Golden Hawks versus Guelph Gryphons football game, a pancake breakfast, Alumni Endzone — Laurier’s designated pre-game event — and an alumni party at Wilf’s restaurant. Among organized Laurier events, the spotlight for the weekend’s celebrations comes back to the massive displays of student celebrations that have now received national attention. Once again, the infamous Ezra Avenue that sits in close proximity to Laurier’s campus saw a sea of young people dressed in purple and gold who were gathered throughout the day on Saturday, which resulted in a forced closure of the road by police, who were there early to manage the crowds and eventually clear out the unsanctioned event. Annually, the Waterloo Regional Police prepare for such gatherings by creating a largely increased and much needed police presence in the areas surrounding campus, especially Ezra Avenue, to monitor and facilitate order amongst students. The peak attendance on Ezra for Saturday has been estimated at 14,000, making it the largest homecoming gathering yet. Amidst the homecoming festivities, Waterloo Regional Police Services laid a total of 462 charges. “[The charges were] mainly alcohol-related: open-liquor, underage drinking [and] public intoxication,” said Cherri Greeno, media relations coordinator at the Waterloo Regional Police Services. Other types of infractions that were abundantly seen over the weekend included Criminal Code and Controlled Drugs and Substances Act offences, Highway Traffic Act and Waterloo by-law breaches, as well as violations of Trespass to Property Act. “For the most part students were celebrating in a respectful manner. However, there were a lot of situations that caused us concern,” Greeno said. “We also saw people jumping from trees [and] damaging neighbours’ property … we are disappointed in some of the behaviour we did see,” she said. The Waterloo Regional Police and Waterloo’s Emergency Response Services received assistance during homecoming festivities from Wilfrid Laurier Special Constables and Peel Regional Police Services. Special Constables received 566 calls for service and issued 114 Provincial Offence Notices — which is alarming when comparing to an average day of service on a weekend. Paramedics were active in responding to 36 calls in relation to homecoming celebrations between 10 a.m. on Saturday and 3 a.m. on Sunday — 20 patients were subsequently transported to local hospitals and six were determined to be in critical condition. Grand River Hospital and St. Mary’s General Hospital in Kitchener saw a combined 37 patients over the weekend — all homecoming related. Throughout the month of September, in response to the influx of students in Waterloo, Waterloo Regional Police are running their annual campaign Project Safe Semester,” Greeno stated. Throughout the duration of the campaign, from Aug. 26 to Sept. 28, there were a total of 687 charges laid; they were composed mostly of Liquor Licence Act, the Highway Traffic Act and by-law infractions. This total does not include the charges laid during homecoming weekend and represents nearly a 125 per cent increase from the same period of time during the campaign in 2017. 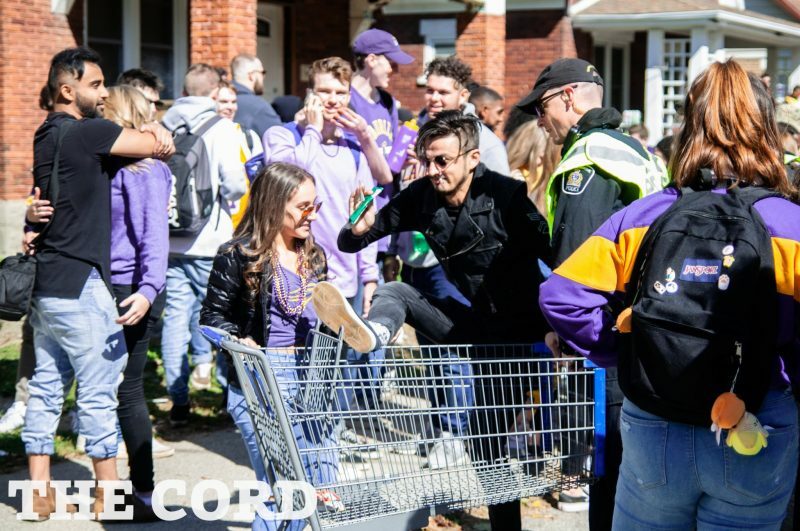 Amongst the more negative feedback that Laurier students and visitors have been receiving regarding homecoming weekend, a group of students took the initiative to reconcile with the environment that subsequently took a beating. On Sunday morning, following the bulk of celebrations, student volunteers from both EcoHawks and Wilfrid Laurier’s Lazaridis Students’ Society teamed up to perform a clean sweep of campus and surrounding areas. “We partnered with the EcoHawks team. Just to cover more space — LazSoc went in one direction and EcoHawks went to Ezra Avenue and the high school close by so we could make the biggest impact possible,” said Kara McDowell, vice-president of internal relations of the Lazaridis Students’ Society. “We should definitely have more volunteers coming out on days like this. We really want to aim for one after St. Patrick’s Day as well,” McDowell added. The Waterloo Regional Police continue to encourage the safe and respectful behaviour of students and visitors who choose to engage in celebration.